Kathleen Springer, left, is running against incumbent City Councilman Costa Constantinides, right. 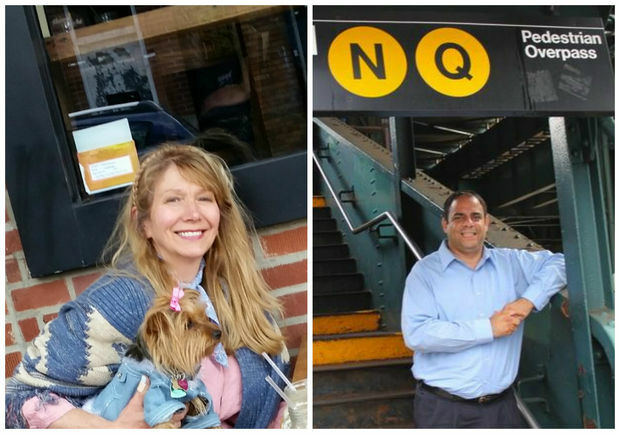 ASTORIA — A local real estate agent who's been pushing the city to restore the long-shuttered diving pool in Astoria Park has jumped into the race for the neighborhood's City Council seat. Kathleen Springer is running as an independent candidate for Council District 22 in the Nov. 7 election, challenging incumbent Councilman Costa Constantinides, who's held the post since 2014. "I am basically running against the machine," said Springer, who grew up in the Marine Terrace apartments near Astoria Park. She also worked for decades in local real estate before selling her Steinway Street firm, Your Neighborhood Realty, in 2009. "I sold or rented a house, or even commercial properties, on almost every block in Astoria," she said. "I know the neighborhood well, and I know a lot of people." Springer, who entered the race on Sept. 26, never considered a foray into politics until recently, when she began collecting signatures to urge the Parks Department to restore the rundown diving pool in Astoria Park — located next to the park's regular pool — to swimmers. The Parks Department has planned for years to pave over the old diving pool and turn it into a public plaza and event space, though Springer believes most residents would rather see it reopened to swimmers. Springer feels that the project is an example of the city's tendency to ignore the wishes of residents, fulfilling the needs "not of the community, but of the people in charge." "I thought, do I have to be a councilman to have this heard? To represent the wants of the community?" she said. If elected, Springer would call for "more oversight on the way money is being spent" in the neighborhood, she said. She disagrees, for example, with the Parks Department's $13.5 million plan to overhaul the Astoria Park running track and install a turf soccer field in the center. "To be ripping it out to put a new track in is just a waste of money," she said. She also opposes the Department of Transportation's conversion of Shore Boulevard last summer to a one-way street, saying it should have been left as it was. She supports bike lanes, but thinks the rollout of 59 new Citi Bike stations in Astoria should have happened gradually. "I think that they should have done like maybe 10 stations to start with, and see how that worked," she said. "I think that Citi Bike has to be responsible — they need to take some responsibility in making sure that people know the rules of the road." If elected, she would try to get a new ferry stop between Astoria and the sports field on Randall's Island, and wants Queens Community Board 1, she said. Springer would aim to be transparent as Councilwoman, keeping residents abreast of relevant issues via email and overall to be "a lot more accessible than my predecessor," she said. "I'd like to modernize all of that, to have more outreach to the residents who actually live here," she said. "I won't have gatekeepers. [Constituents] can reach me on my cellphone," Springer added. "I'd like to have my constituents have more of a say than my largest campaign donors." When asked to comment on his challenger's campaign, Constantinides said he "welcomed her to the race." "I think that this race coming up on the 7th is really going to be defined by who has a track record of results and who is best suited to represent our community for the next four years," he said. The councilman cited a series of his own accomplishments from his first term, like funding parks and playgrounds across the district, building science labs along with other improvements at local schools and paying for street cleaning to tackle local litter. "I've been able to do all those things by working with partners, by building relationships and delivering for our community time after time," Constantinides said. "I feel this election is about who can deliver these results."